Ea One koi Food has been developed in conjuction with Dragon Feeds to best suit the physiology of koi carp. Ea One koi Food contains worms, crustacea and vegetation. This is the staple diet of carp in the wild. Most current koi feeds, including winter 'wheatgerm - type' foods contain fish meal. Koi do not eat fish as part of their staple diet. The polychaete worms are farmed by Dragon, these contain high levels of natural compounds which explain the worm's ability to re-generate their bodies after being severed. It is these regenerative compounds that have been shown to have therapeutic effects when fed to fish. All of this results in incredible growth and improved health which your koi will experience after being fed this ground-breaking new product. EA One is an all year round food. First you will need to calculate the total weight of fish in your pond. An alternative to actually weighing your fish is to use the above graph. 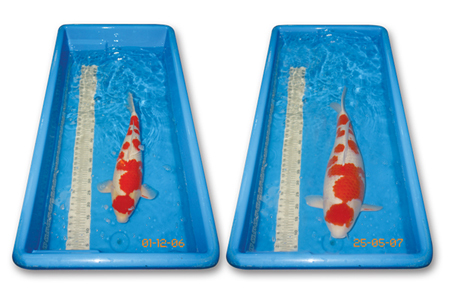 It shows typical average weights of koi at various lengths. For optimum benefit feed the amount of food suggested in the table below, which is a percentage of the total weight of your fish in relation to pond temperature. Feed twice daily (morning & evening). E.g. if you have a pond containing 10kg of fish with a water temperature of 17 oC, the total amount of food fed each day is 1% of 10kg = 100g. This 100g should be fed 50g in the morning and 50g in the evening. Why dont you order yours now here, we are sure you will be delighted with the results! How do you get a five year old kohaku that had virtually stopped growing, to put on phenomenal length and volume like this in 6 months!? A revolutionary new food based on common sense. A food containing what carp actually eat in the wild... worms, crustacea, vegetation, and because they don't eat fish in the wild - NO fish meal!